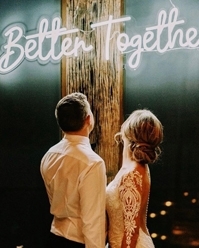 Custom Neon | Handmade Neon Sign Art | All About US! Energy Efficient - Our neon lighted signs are both economical and ecologically friendly. They have low energy consumption and a 50,000+ hour lifespan. Our LED neon flex signs are much cheaper than glass neon signs. No special installation team needed, just hang as you would any sign or wall art. Practically maintenance free. 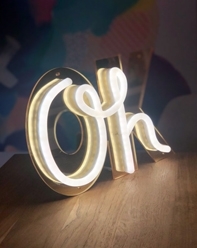 In early 2018 Jake & Jess discovered a gap in the market for accessible, creative and affordable neon signs whilst looking for a kid-safe neon light for their baby son’s bedroom. Fast forward to today and Custom Neon has continued to grow across industries, demographics and geographical boarders. The brand has modernized the way people feel about neon look LED lights and the impact and versatility that LED neon lighting brings to any space. 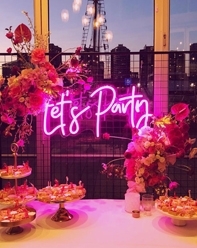 We create stunning LED neon light art, a wide variety of eye-catching business signs, beautiful wedding name signs, personalized neon signs as gifts, customized neon home décor, and photo worthy LED neon signs for parties and events. All of our signs, sculptures, wall art and lamps are handcrafted using flexible LED, mounted on clear acrylic backboards, stands or boxes. LED flex neon products are more cost-effective, durable, energy efficient, safer, and lighter than glass neon products, while providing an incredible visual impact that is on par with, or even greater than, what you get with a traditional glass neon sign. We live by the philosophy that art should be approachable, with easy-to-design, on-trend LED neon signs. We design and create handmade neon signs for every conceivable space or event. Turn your favorite song, quote, child’s name (even the shape of your dog!) into a colorful neon sign / table lamp / aesthetic neon sculpture / wall light. Modern LED neon knows no limits! Ready to Get a Custom Neon™ Sign? 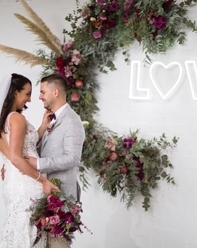 We have thousands of satisfied customers that include internationally recognized brands, local stores and restaurants, Instagram stars, brides, party planners, home decorators, and so many others. Are you ready to get your own Custom Neon™? Click for neon LED flex business signs, open signs, wedding signs, LED neon lights for events and parties, bar signs, personalized neon signs, wall art, and neon LED light signs and lamps for home decor.